High growth in Turkey – as in last year’s steroid-driven (estimated) 6.5%+ rate – typically comes at a cost in the form of higher “imbalances”, i.e. markedly higher inflation and current account deficits (CAD). For some time, there has been a tendency in the local media — in the comments of senior government officials, in particular — to sort of ignore this basic reality, underplay its importance or pretend that things have changed for the better. In the case of inflation, this has taken the form of putting too much emphasis on food inflation as the main inflation driver, and as a consequence, giving undue significance to the (yet to be fully documented /understood) work of the “food committee” in reducing inflation. In the case of CAD, in its recent Inflation Report (see Box 4.1 here), the Central Bank has argued that “[t]he current account balance improved without any decline in the national income, which indicates that the adopted fiscal measures and incentives as well as macro-prudential policies were successful in balancing the economy”. The two charts below (of course, we could add several more but we are trying to save you the trouble) help to make this point. 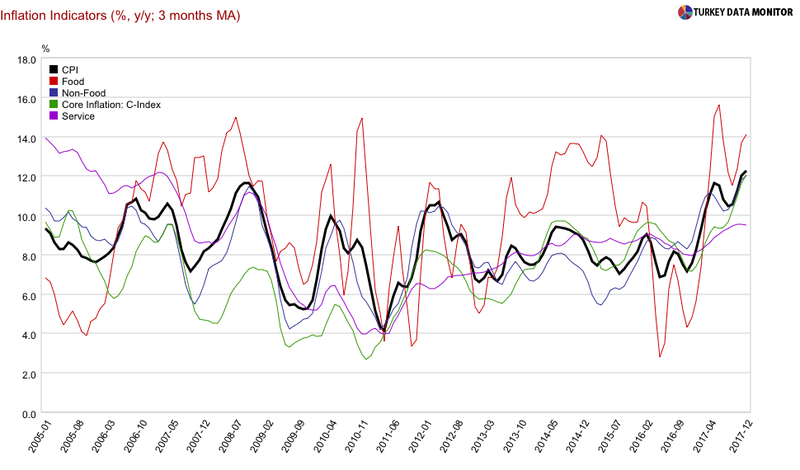 The first chart shows that food inflation is surely high, but so are non-food, core and service inflation rates. With inflation expectations entirely unanchored as well, running at near-double-digits, it is hard to sell inflation problem as a “mostly food” problem. The second chart suggests that the claim regarding the improved link between growth and CAD (basically based on two quarters of data in the above noted CBRT research) is quite premature at best. Just notice how goods imports – with a lag of sorts – began to outpace exports in the final months of the year. 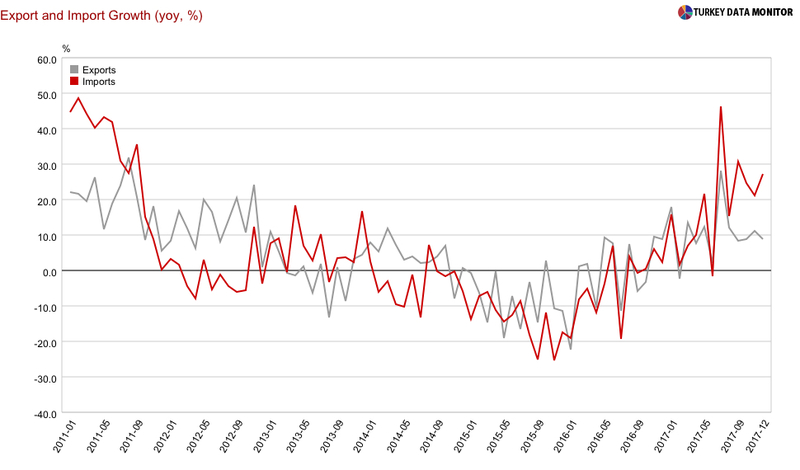 With the trade deficit (even after adjusting for gold and energy — not shown) rapidly widening, it is hard to argue that Turkey has miraculously learnt to grow faster with a lower CAD (since trade deficit is the key driver of CAD). The truth is, Turkey seems to have been benefitting — and continues to benefit – from a “curious case of missing defaults” syndrome — a phrase inspired by the recent work of Carmen Reinhart et. al. (also covered here by the Economist). True, EMs themselves are stronger, but the global environment staying exceptionally accommodative and benign is a great part of the “resilience” narrative, of Turkey in particular, which in reality is nothing but an enhanced ability to bide our time and “delay adjustment”, thanks to a very accommodative global environment.